We made it through the first night with our mini pig! Little Oscar was sleepy from the ride home and the big garage chase, so he slept well through the night. Now it was time for us to feed him for the first time. 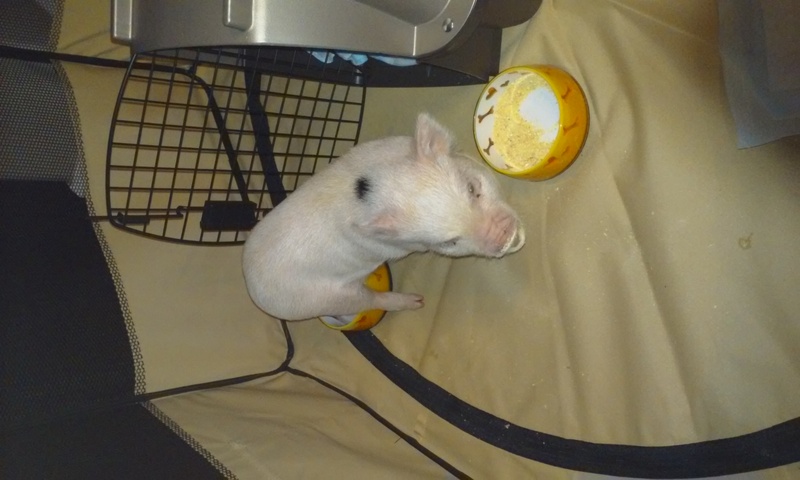 What to feed him was easy since the breeder gave us a container of ground up mini pig food (Mazuri Mini Pig Youth), so we measured out 1/4 cup of that and put it in a bowl we bought him. Now, where to feed him? This was a little more complicated since we have dogs in the house. One of our dogs was already a food guarder when we brought him home from the shelter and it makes feeding him and the other animals challenging, so I wanted to make sure Oscar felt safe and comfortable while eating as to not develop any guarding tendencies. We decided to use the play pen and put Oscar in it with his food and water bowl; that way he would feel safe while eating but could still see out and be part of the family. How did the first meal go? Ground food + water + a hungry mini pig = Messy! We were glad we fed him in the play pen so that we didn’t have to worry about the mess as much and enjoyed watching him eat instead. Having never watched a pig eat, it was entertaining and even adorable. He really loves his mini pig food! Note: the mess gets less adorable each day but switching to the pellet version of the mini pig food and trying some creative feeding methods such as using his ball pit and food ball solved that issue. Oscar eating his first meal at home. Oscar with a mini pig mustache. One successful meal down and many to go!